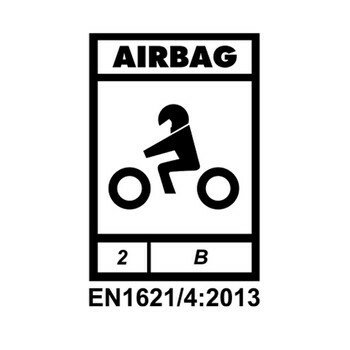 EN1621/4 certificated airbag systems are labelled with the relevant pictogram, which present and explain the safety features to the customers along with the relevant EN certification code. In order to avoid each airbag system manufacturers to test in independently, there is a unique European standard called EN1621/4:2013. Motorcycle protective clothing against impact requires conformity to Part 4: Inflatable Motorcyclists Protectors – Requirements and test methods. In the European Standard there are very stringent tests that are to be performed in order to verify that the airbag is a Personal Protective Equipment for motorcyclists under Part 4: Inflatable Motorcyclists Protectors. The results of impact tests on the Merlin Airbag powered by MOTOAIRBAG show that the transmitted force for the back airbag system is only 1,4 kN.